When we think of art collecting today, the names Gogosian and Saatchi come to mind. Huge international galleries function almost like stock markets, catering to wealthy individuals who buy art for its investment as well as esthetic value. Collecting Matisse and Picasso: The Cone Sisters of Baltimore, an exhibition at The Jewish Museum, provides a different perspective on the art of collecting. Dr. Claribel Cone and her sister Etta collected before there was a market. They bought Matisse when critics savaged his work and those of his contemporaries in the Salon D’Autonme (1908), dubbing them les Fauves, or wild beasts. By 1913, when Matisse, Picasso and Cezanne were presented to New York society in the famed Armory Show, Claribel and Etta had already been collecting for a decade. Gertrude and Leo Stein befriended the Cones, further helping the sisters, who were beneficiaries of the fortune that their brothers Moses and Ceasar made in the cotton trade, to feed their passion for art. There are many wealthy people, but relatively few amass a trove of art that rivals the Cone sisters’ collection, which would eventually comprise 3,000 works, now housed in the Baltimore Museum of Art. Their accomplishment underscores the importance of the pure form of collecting that comes out of a love of beauty, as well as the crucial role that patronage plays in the survival of artists, particularly in seminal periods like that which led up to so-called Modernism. The Cones, like Gertrude Stein and Alice B. Toklas, took an almost maternal role towards artists like Matisse and Picasso. 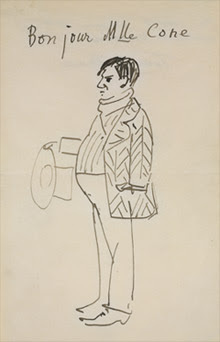 There is a wonderful Picasso drawing in the show, which was included in a letter to Etta, in which the artist portrays himself as a portly gent with his hat in his hand. In a BBC documentary narrated by Michael Palin, which is part of the current exhibition, a commentator remarks that when you looked out of the Marlborough apartments—the building the Cones occupied in Baltimore—you saw the past, but on their walls you saw the future, insured by the sisters’ loving attention.